Recent reports indicate different side-effects of the new medication for psoriasis. Adalimumab. Adalimumab is a biologic agent acting as tumor necrosis factor alpha inhibitor. It is wildly used in treating psoriasis, following a national guide treatment. We report a clinical case of subacute thyroiditis induced by adalimumab in a psoriatic patient. A 54-year-old Caucasian female addressed to our dermatology clinic in 2008 with a 3 years history of moderate to severe psoriasis. The patient had been experiencing non-disabling joint pain in both knees and wrists for several years. Her medical history was remarkable for pulmonary sarcoidosis (at the age of 32), arterial hypertension and angina pectoris. The patient was started on adalimumab 40 mg twice monthly with good clinical evolution, but she was diagnosed, a few months after starting the therapy, with subacute thyroiditis with severe evolution, with transitory hyperthyroidism (thyroid stimulating hormone 0.1 uIU/ml). The treatment with adalimumab was discontinued, the symptoms cleared in 3 weeks with non-steroidal anti-inflammatory drugs and a fully recovered thyroid status was obtained in 1 month. The patient continued the psoriatic medication (adalimumab) with no influence on thyroid status. We describe a case of subacute thyroiditis in a psoriatic patient treated with adalimumab, with a very good clinical evolution with non-steroidal anti-inflammatory medication. Liaison between dermatologists and in this case, endocrinologists and rheumatologists, will help to determine the prevalence of these reactions and to provide insights into the very complex mechanisms of both diseases. We describe a case of subacute thyroiditis in a psoriatic patient treated with adalimumab, with a very good clinical evolution with non-steroidal anti-inflammatory medication. This was a case report of a 54-year-old Caucasian female addressed to our dermatology clinic in 2008 with a 3 years history of moderate to severe psoriasis. The lesions were first noticed on the hands and feet [Figure 1], with some involvement of the scalp and trunk. The patient had been experiencing non-disabling joint pain in both knees and wrists for several years. Her medical history was remarkable for pulmonary sarcoidosis (at the age of 32), arterial hypertension and angina pectoris. 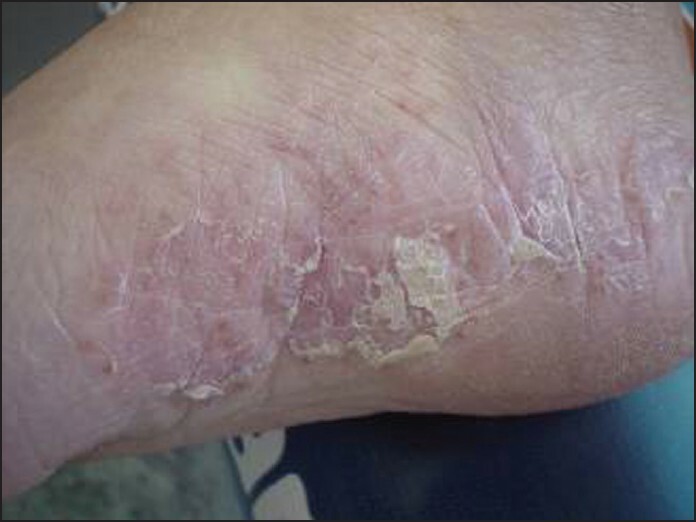 The patient's initial psoriatic lesions were managed with a variety of topical regimens including steroids class II, calcipotriene, tacrolimus, with only minimal clearing of her skin lesions. The patient had also been treated with methotrexat and phototherapy ultraviolet B (UVB) (short wave narrowband UVB wavelength shall be 311) in the past, but with no results. The patient was started on adalimumab 40 mg twice monthly, the plaques on her trunk demonstrated marked improvement, but the psoriatic lesions on the palms and feet were only mildly improved. After several months of treatment, with good response to adalimumab, the patient was diagnosed with subacute thyroiditis at the endocrinology department, for sudden onset of pain in the region of the thyroid gland, fever, cervical lymphadenopathy. The pain was aggravated by turning the head and radiated to the ear and jaw. She was nervous, tired and complained for palpitation. On palpation, the gland was moderately enlarged, tender, the right lobe being more affected then left one. A complete laboratory and imaging evaluation was performed in order to investigate possible associated systemic disorders, infectious, or inflammatory conditions. Routine laboratory tests were normal, except for an elevated white blood cell count (11.2 × 10΃/μL) with neutrophilia (67%); a C reactive protein of 48 mg/dL; and an erythrocyte sedimentation rate of 78 mm/h. In addition, renal function tests, serum protein electrophoresis and immunoelectrophoresis were within normal values. Findings were also normal or negative for immunological tests (rheumatoid factor, anti-nuclear antibodies, anti-double stranded deoxyribonucleic acid antibodies, anti-extractable nuclear antigen antibodies and complement). Circulating antibodies to thyroid peroxidase were also present in normal titers, thyroid stimulating hormone (TSH) was within normal values: 0.2 (normal ranges between 0.39 and 6.16 uIU/ml). • Left thyroid lobule: 2 cm × 2.5 cm × 5 cm (12.5 cm) slight hipoechogenous, thyroid volume 20 ml. Left thyroid lobule: 1.5 cm × 2 cm × 6 cm (9 cm) non-homogenous aspect. Basal serum TSH was now suppressed (0.1 uIU/ml), the patient being in transitory hyperthyroidism phase. The treatment was started with non-steroidal anti-inflammatory drugs and the symptoms cleared in about 3 weeks. Corticotherapy was not allowed due to biological treatment for psoriasis. A reevaluation of the patient 2 weeks after the initiation of the anti-inflammatory therapy revealed no hyperthyroidism manifestations, tender or pain. Mild increase of TSH (4.5 IU/ml) reflected the transitory hypothyroidism phase for which no treatment was necessary. A full thyroid function was recovered in 1 month. Adalimumab was continued 1 year after the episode of thyroiditis. It was discontinued 13 months later for peritonitis and hepatic hidatic cyst (ruptured). TNF-α inhibitors represent efficacious and relatively safe therapeutic agents in many chronic inflammatory diseases. An association between their use and an increased risk of complications has received much attention in the past. Armstrong et al. studies whether systemic treatments for psoriasis or psoriatic arthritis affect cardiovascular comorbidities. Objective of the study was to examine the effects of biologic agents and other disease-modifying antirheumatic drugs used to treat psoriasis and psoriatic arthritis on cardiovascular risk factors and adverse cardiovascular outcomes. The preliminary epidemiologic studies found that the use of TNF inhibitors may be associated with reduced risk of adverse cardiovascular events. Sauder and Glassman described that subcorneal pustular dermatosis, in addition to psoriasis vulgaris and pustular psoriasis may occur in patients treated with TNF-α inhibitors like adalimumab. Clinical and histopathological features of a pustular skin condition which occurred in a 48-year-old woman with RA who had started adalimumab 4 months prior. Described by one case alopecia areata in patient treatment with adalimubab. A 43-year-old man with psoriasis and psoriatic arthritis who developed AA during his treatment with adalimumab and leflunomide. One of varieties of psoriasis is palmoplantar pustulosis (PP). More authors presented good effect treatment of adalimubab of PP. , We described a case of subacute thyroiditis in a psoriatic patient treated with adalimumab. Among the side effects of the drug (adalimubab), into the available publications, we did not find description subacute thyroiditis after treatment of adalimubab. Authors from Italy described that yours results demonstrate a significantly higher prevalence of thyroid autoimmunity (positive anti-thyroid peroxidase antibodies [AbTPO], hypoechoic thyroid) findings in men and women with prostate-specific antigen (PsA) and of subclinical hypothyroidism in women with PsA than in the general population. However patients were not treated with biological agents. AbTPO, a hypoechoic thyroid and subclinical hypothyroidism were significantly more frequent in women with PsA than in control women and their frequency was similar to that in patients with RA (positive AbTPO titer 28%, 12% and 31%; hypoechoic thyroid 31%, 16% and 36%; subclinical hypothyroidism 25%, 8% and 12%, respectively). Among men, positive AbTPO titers and a hypoechoic thyroid were found more frequently in patients with PsA and RA than in controls (positive AbTPO titer 14%, 5% and 2%; hypoechoic thyroid 16%, 10% and 3%, respectively). All patients with PsA with subclinical hypothyroidism had polyarticular involvement (P ≤ 0.05) and a longer disease duration (years 19 ± 15 vs. 11 ± 8, P = 0.03) than patients with euthyroid PsA. The prevalence of subclinical hyperthyroidism, thyroid nodules and thyroid enlargement was not significantly different among the three groups. As the use of biologic drugs becomes more widespread over years (adalimumab is effective treatments for psoriasis patients who are not well controlled by conventional therapy), clinicians from a variety of disciplines are increasingly likely to encounter different side effects of this treatment. Liaison between dermatologists and in this case, endocrinologists and rheumatologists, will help to determine the prevalence of these reactions and to provide insights into the very complex mechanisms of both diseases. Patient was diagnosed with thyroiditis during treatment with adalimumab for the 1 st time. We present a case of subacute thyroiditis in a psoriatic patient treated with adalimumab considering it not a coincidence but rather a side-effect of treatment. 1. Puri N, Mahajan BB, Sandhu SK. Clinical evaluation of different therapeutic modalities in psoriasis by pasi score. Our Dermatol Online 2013;4:16-22. 2. Vergou T, Moustou AE, Sfikakis PP, Antoniou C, Stratigos AJ. Pharmacodynamics of TNF-α inhibitors in psoriasis. Expert Rev Clin Pharmacol 2011;4:515-23. 3. Baker EL, Coleman CI, Reinhart KM, Phung OJ, Kugelman L, Chen W, et al. Effect of biologic agents on Non-PASI outcomes in moderate-to-severe plaque psoriasis: Systematic review and meta-analyses. Dermatol Ther (Heidelb) 2012;2:9. 4. Abreu Velez AM, Howard WR, Howard MS. Upregulation of anti-human ribosomal protein S6-p240, topoisomerase II ?, Cyclin D1, BCL-2 and anti-corneal antibodies in acute psoriasis. N Dermatol Online 2011;2:113-7. 5. Rana S, Zeeba JS, Sujata J, Madhur K. A comparative study of psoriasis and psoriasiform lesion on basis of CD4 and CD8 cell infiltration. Our Dermatol Online 2012;3:292-7. 6. Nestle FO, Kaplan DH, Barker J. Psoriasis. N Engl J Med 2009;361:496-509. 7. Papp KA, Dekoven J, Parsons L, Pirzada S, Robern M, Robertson L, et al. Biologic therapy in psoriasis: Perspectives on associated risks and patient management. J Cutan Med Surg 2012;16:153-68. 8. Brezinski EA, Armstrong AW. Off-label biologic regimens in psoriasis: A systematic review of efficacy and safety of dose escalation, reduction, and interrupted biologic therapy. PLoS One 2012;7:e33486. 9. Aubin F, Barthelemy H. Adalimumab. Ann Dermatol Venereol 2011;138:842-4. 10. Hassan I, Yaseen U, Ahmad M, Masood Q. Manubriosternal joint involvement in psoriatic arthritis. N Dermatol Online 2011;2:68-9. 11. Puri N. Infantile psoriasis treated successfully with topical calcipotriene. Our Dermatol Online 2013;4:205-7. 12. Gordon KB, Langley RG, Leonardi C, Toth D, Menter MA, Kang S, et al. Clinical response to adalimumab treatment in patients with moderate to severe psoriasis: Double-blind, randomized controlled trial and open-label extension study. J Am Acad Dermatol 2006;55:598-606. 13. Menter A, Tyring SK, Gordon K, Kimball AB, Leonardi CL, Langley RG, et al. Adalimumab therapy for moderate to severe psoriasis: A randomized, controlled phase III trial. J Am Acad Dermatol 2008;58:106-15. 14. Papp K, Crowley J, Ortonne JP, Leu J, Okun M, Gupta SR, et al. Adalimumab for moderate to severe chronic plaque psoriasis: Efficacy and safety of retreatment and disease recurrence following withdrawal from therapy. Br J Dermatol 2011;164:434-41. 15. Al-Mutairi A, Elkashlan M, Al-Fayed HM, Swayed M. TNF-α inhibitor (adalimumab) induced psoriasis: A case report. Australas J Dermatol 2012;53:157. 16. Armstrong AW, Brezinski EA, Follansbee MR, Armstrong EJ. Effects of biologic agents and other disease-modifying antirheumatic drugs on cardiovascular outcomes in psoriasis and psoriatic arthritis: A systematic review. Curr Pharm Des 2014;20:500-12. 17. Hemmati I, Kur J. Adalimumab-associated antiphospholipid syndrome: A case report and review of the literature. Clin Rheumatol 2013;32:1095-8. 18. Sauder MB, Glassman SJ. Palmoplantar subcorneal pustular dermatosis following adalimumab therapy for rheumatoid arthritis. Int J Dermatol 2013;52:624-8. 19. Park JH, Lee J, Lee JH, Lee DY, Koh EM. Lymphomatoid papulosis in a patient treated with adalimumab for juvenile rheumatoid arthritis. Dermatology 2012;225:259-63. 20. Imafuku S, Ito K, Nakayama J. Cutaneous pseudolymphoma induced by adalimumab and reproduced by infliximab in a patient with arthropathic psoriasis. Br J Dermatol 2012;166:675-8. 21. Simpkin S, Oakley A. Multiple eruptive squamous cell carcinoma in a patient with chronic plaque psoriasis on adalimumab. Australas J Dermatol 2013;54:55-8. 22. Navarro R, Daudén E, Gallo E, Santiago Sánchez-Mateos D, García-Diez A. Alopecia areata during treatment of psoriasis with adalimumab and leflunomide: A case and review of the literature. Skin Pharmacol Physiol 2012;25:107-10. 23. Mishra V, Daniel RC, Elmets CA, Levin A, Elewski BE. Palmoplantar pustulosis with fulminant dystrophic 20-nail psoriasis in a patient receiving adalimumab therapy. J Drugs Dermatol 2013;12:16-7. 24. Vijayashankar M, Raghunath N. Pustular psoriasis responding to probiotics - A new insight. Our Dermatol Online 2012;3:326-9. 25. Antonelli A, Delle Sedie A, Fallahi P, Ferrari SM, Maccheroni M, Ferrannini E, et al. High prevalence of thyroid autoimmunity and hypothyroidism in patients with psoriatic arthritis. J Rheumatol 2006;33:2026-8.